Plants make it rain — it turns out that when you cut or burn down a rainforest, it often stops raining in that area. 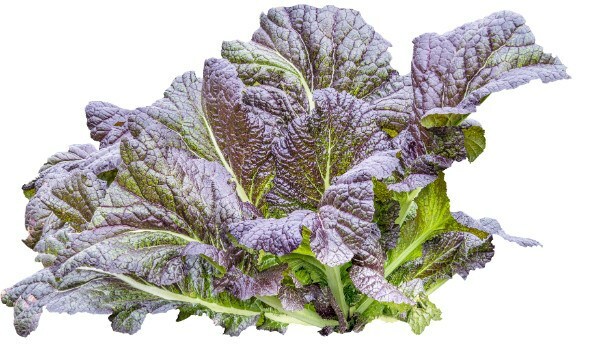 Did you know that cancer-fighting carotenoids are found not only in orange vegetables like carrots, but also in dark, leafy greens like these mustard greens? They help make soil and then they help protect it. They are alchemists, the original pharmacists making all of our drugs. If you follow the steps outlined on this website, you will be getting natural doses of plenty of compounds that end up in our most common pharmaceuticals, but without the harmful side effects that come from isolating and concentrating these compounds into drugs. Plants are an integral part of the soil food web. Their roots work through the soil, create fresh organic matter as they constantly grow and die back, and actually dissolve rock to form soil. Their bodies turn into organic matter every autumn when the leaves fall, and also at the end of their lives. Plants know when a storm is coming and experience electromagnetic “nightmares” when it arrives. They may have musical preferences. They know how you feel about them. They know when a spider is climbing up the fence beside them. 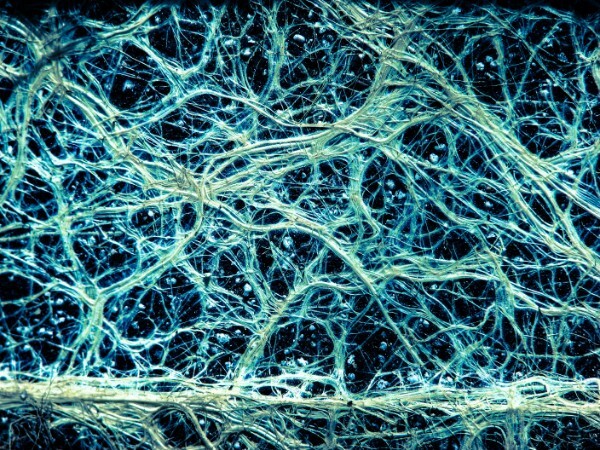 Plants’ fine root hairs both look and work like a neural net. They share nutrients with each other, through the mycorrhizal fungi that not only attach to their roots but attach to the roots of most of the other plants nearby, even miles away. Most of us can’t communicate with them very well anymore, but that doesn’t mean they aren’t good communicators. They certainly communicate with animals, bacteria, fungi and each other. They seem to invite so-called “pests” and “diseases” to eat them when the time is right (more on that another time). At the same time, they warn each other when they are being eaten so others can fortify. They communicate with bacteria to help them build homes right on their roots in order to facilitate nitrogen fixation, and with mycorrhizal fungi when the fungi are entering their root cells. 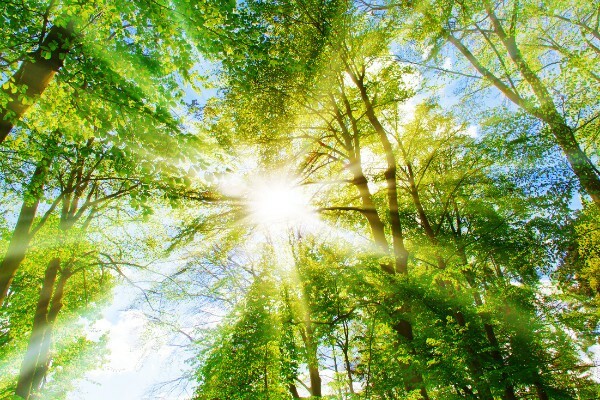 Plants “eat” primarily by photosynthesis. They break down carbon dioxide and water and turn them into various carbon-based molecules. They need the energy from the sun, along with proteins and minerals to make this happen. Oxygen is released during this process, which allows us to hang around this planet. So they need carbon dioxide, water, proteins, minerals and Mr. Golden Sun. Interestingly, plants are composed of about 95% carbon, oxygen and hydrogen, so the proteins and minerals are only a small, but vital part. This photosynthesis takes places in the leaves and other green plant parts. While plants get carbon dioxide from the air, they are actually very happy to get as much of their carbon as possible from the soil through their roots. And while the roots are the major water and mineral harvesters, the leaves perform these functions, too. The most evident part of our job as gardeners with respect to photosynthesis is just to make sure we put plants in the right sun exposure in the garden and make sure they have enough water available. Then they can then get the right amount of sun, carbon dioxide and water — all of which is 95% of what they need. This is easy enough with a little bit of plant knowledge and a water source. As I said earlier, even though the minerals make up only 5% of the plant, they are crucial. Gardeners also have a role in making sure our soil has the right mineral balance because we are planting many things that probably wouldn’t be growing there if they had the choice. Almost any soil will support some kind of plant life, but if we are particular about what plants we want to see, and if we want these plants to be healthy, there is usually some work to do. Healthy soil is not only rich in nutrients and organic matter, but supports plenty of diverse organisms, large and small. Like us, plants breathe oxygen. While only the green parts photosynthesize, all cells breathe. The main purpose of breathing is turning those carbon-based molecules from photosynthesis into more useful forms of energy. The roots need to breathe, too, so they need air in the soil. The organisms in the soil help make big pore spaces for this air. We cannot sustainably create this through tilling or aerating — in fact, these ultimately do the opposite if done too often, and we end up with compacted soil. There can be benefits to doing this in the short term, but in the long term, we need to focus on making sure the soil dwellers have the tools they need to do a good job. Plants are exceptionally good at surviving. Some have thorns to ward off animals. Some have thick bark, or thick hair, or wax on their leaves. They build themselves with ingredients that are difficult for microbes to digest. When their branches get injured, they just discard them and grow a new one. Before they drop them, they make sure to build a strong scar, often with toxins so predators can’t get in. This is one reason why we don’t necessarily want to prune all damaged plant parts or the leaves and flowers of our perennials after flowering that are turning brown. The plant will drop them when it’s ready. A well-healed scar from a branch the tree dropped naturally. Plants produce chemicals for defense. Some of them are kept in a special storage area of the plant to be moved and used only when needed. Other chemicals are in the leaves all the time. Some are produced as more of a general feeding deterrent and some are quick-acting poisons. Hydrogen peroxide is used to counteract enzymes secreted by certain pathogenic fungi, while other chemicals just kill the fungi directly. Some of these chemicals become our pharmaceuticals and pesticides. Salicylic acid is abundant in many fruits and vegetables when they are grown on healthy soil. Aspirin uses a synthetic alternative, acetylsalicylic acid, that can cause side effects. I can follow my doctor’s advice and take aspirin every day if I want to experience some of these side effects, or I can eat fruits and vegetables grown in healthy soil. Some plants employ others to help defend them — bacteria, fungi, and even insects. One of the most famous insect/plant examples is the ant/acacia relationship. Certain species of acacia trees provide homes and food for ants, who in turn protect the plant from insects and even herbivores. They even prune away other plants that are getting too close. More common to all plants: bacteria and fungi colonize them from head to toe, protecting them in exchange for food. Different kinds of plants have different survival strategies. 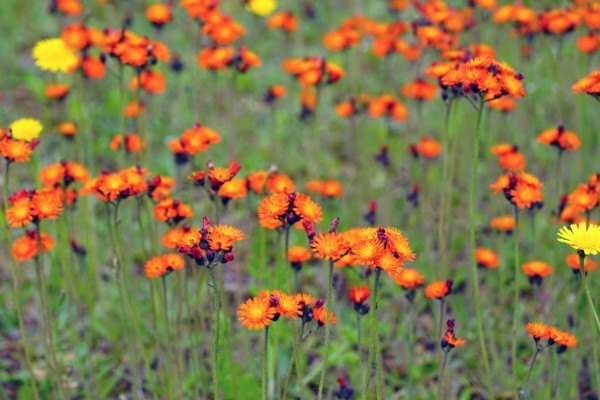 Like many “weeds,” hawkweed is a typical ruderal plant – it grows fast and spreads a lot of seeds. Some plants, especially annuals, survive by simply growing really fast to get above plant-feeding animals and by producing tens of thousands of seeds from each flower. 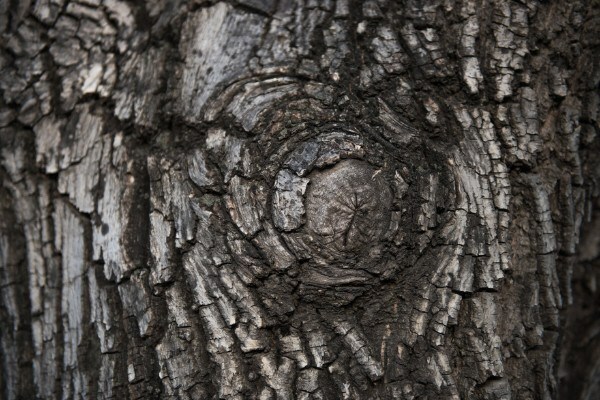 It’s good for us to learn about all of these things because in order to produce strong bark, build strong leaf scars, produce toxins, cooperate with other species, and produce many seeds, plants need healthy soil. Plants are exceptionally good at surviving – if they have the raw materials they need. Plants need light, of course, some more than others. Put a shade plant into full sun and it will probably get sick. The same goes for a sun-loving plant placed in the shade. Some microbes like light, too, even those in the soil. Light is guided down to the root zone along the roots. Interestingly, light intensity in much of North America has decreased at least 10% in the last 50 years from pollution. Plants are over 50% air. They’re over 40% carbon, most of which comes directly from the air, and over 40% oxygen, which comes from the air and from water. They’re 1-4% nitrogen, which originates in the air. 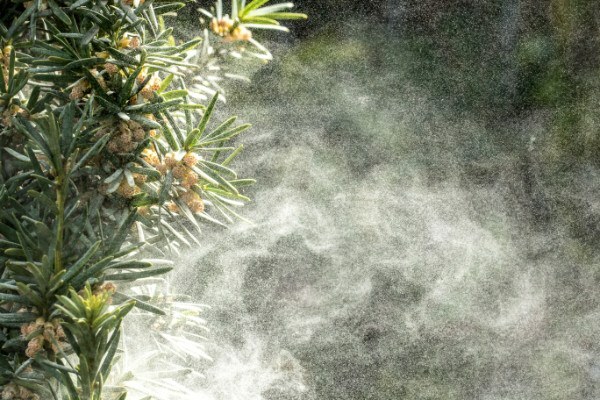 Like grasses, conifers are wind-pollinated, so they have to make a lot more pollen than insect-pollinated plants in order to reproduce successfully. The air in most North American gardens contains pollutants that have traveled across the ocean from Asia. Pesticide spray can come into your garden from 50 miles away. Acid rain — caused largely by us through our vehicles, factories, electricity generation plants, and meat production — is causing environmental problems around the world. As organic gardeners, air is important to us, but we admittedly don’t think much about it because we don’t have much control over it. Sure, we can drive less, fly less, and use less power in general. We can eat less meat and not burn toxic things. But is there anything we can do in the garden? To start, it makes sense to think about air circulation across your property when you’re designing your garden and place plants and structures in a manner that allows for air movement. The biology in the soil needs air, too. Most of the helpful bacteria and fungi are aerobic. They need air just like us. So do plant roots. A healthy soil is made up of approximately 25% air. This is not achieved long-term by rototilling or aerating the soil. In fact, that can destroy the soil structure if you do it too often. Proper air in the soil is achieved not by us, but by the hard work of the microorganisms, insects and earthworms building themselves cities. Our only job is giving them the tools they need to do this. Plants grow in a certain temperature range, which varies depending on where the plant evolved. When it gets too hot, they manufacture proteins to protect themselves, and they start breathing more quickly, which means they’re releasing more water, which in turn cools them. We simulate this when we spray a little bit of water on the leaves during a very hot afternoon. We used to think the water drops magnified the sun and burned the plants, but subsequent research showed this isn’t the case. 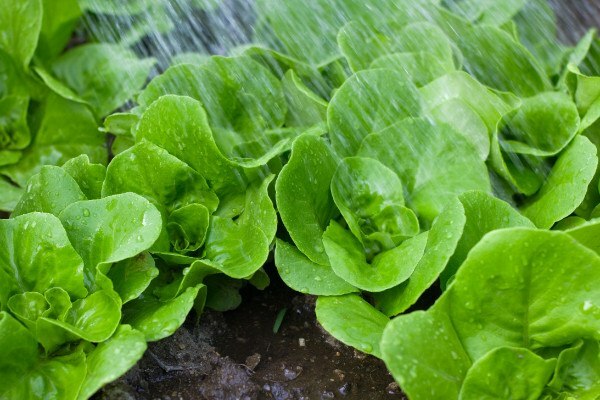 Spraying your lettuce or other leafy greens in mid-afternoon can help delay bolting. Before it gets too cold in the fall, annual plants have produced seed and died, perennials and other deciduous plants have stored their nutrients back in their stems and roots before discarding their leaves. 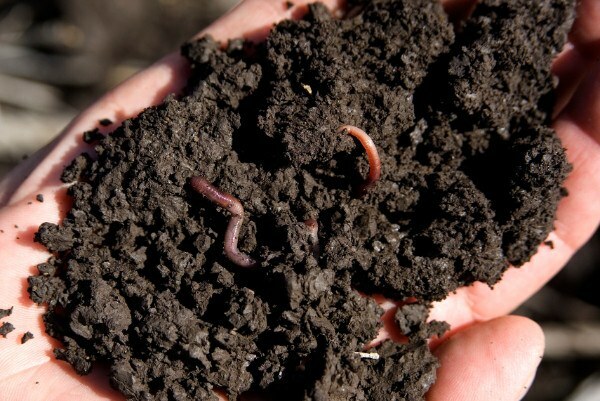 In the soil, most microbes don’t get to work until it’s warm enough for them. The overall metabolic activity of the soil food web doubles for every 18 degrees Fahrenheit (10 degrees Celsius) increase in temperature. This means nutrients in the soil become available to plants in the spring just when they need them, although there may be a temporary deficiency in certain nutrients until certain microbes get moving. Phosphorus is the most important example of this. Mycorrhizal fungi are major suppliers of phosphorus to most plants and they need relatively warm temperatures to get to work. Foliar fertilizers can be useful during these times because they’re quickly taken up by plants. We also want to have enough air in our soil so that it warms up quickly in the spring. A compacted, wet soil stays cooler much longer. 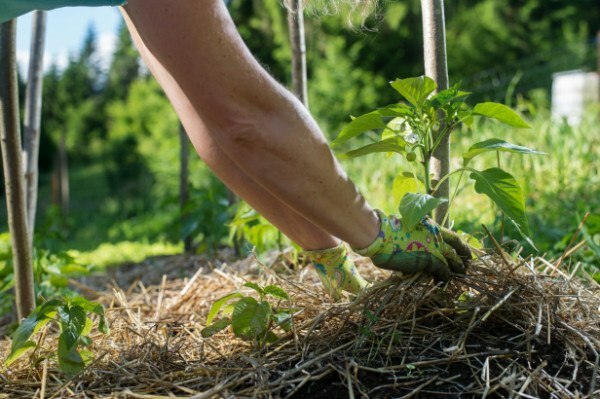 Mulch has an insulating effect on soil, protecting it from extremes of both heat and cold. Traditionally, some farmers would throw rocks or other substances such as charcoal on their fields to melt the snow more quickly. In our garden, we may temporarily rake the mulch layer aside so the air and sun can more quickly warm the soil. We also want to promote a dark, organic soil that absorbs more heat, and we want a mulch layer in the winter to protect the soil from freezing temperatures, and in the summer to protect the soil from the heat. Organic matter — a crucial component of soil health — may even disappear too quickly in the summer if the soil becomes too hot. Which Nutrients Do Plants Need? You’ll see that I will use the words mineral and nutrient, so let’s clarify the difference. A mineral is solid in its natural state and can always be identified by a specific chemical composition. Many elements are minerals, such as calcium and magnesium, as are combinations of elements (molecules) such as quartz. A nutrient is a broader term that includes minerals, vitamins and any other chemical or compound that an organism needs to live. For a long time, we thought plants needed only 16 elements from the periodic table. We know better now, although many horticulture schools and gardening books still teach this. Of course, plants need those elements and they may be the most important, but many plants also need a majority of the 80+ elements in the soil, if only in tiny amounts. We don’t really know exactly what they need, but we know it’s more complicated than just involving 16 elements. I’ve always found it difficult to make sense of what all the nutrients actually do in plants, perhaps because it’s very complex, or perhaps because I never thought it was the most important thing to remember. Yes, nutrients are important, but as to what happens when they get into the plant, I leave that up to the plant. It’s still good to know a few of the basics and I’ll get into this when we look at supplementing nutrients down the road. What we need to know for now is that plants need access to many nutrients in specific amounts and ratios in the soil, and we may need to help balance those proportions because our soils are generally out of balance for what we want to grow. Minerals make up only about 5% of a plant, but they are involved in every process that goes on in the plant. 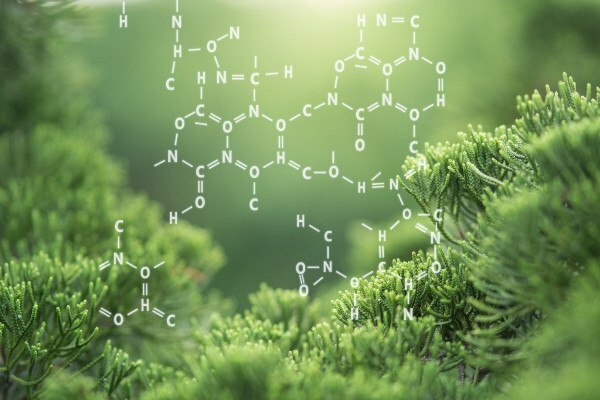 Plant biochemistry is complex and still very imperfectly understood. Plant tissue tests can show us how much of each mineral is in a given leaf, but that doesn’t necessarily translate to how much they take up, or how much is in the soil, or how much we need to supply as fertilizer. It’s important to remember there are three elements we don’t often think about because we don’t generally try to supply them as fertilizers: carbon, oxygen and hydrogen. We should think of them because they comprise more than 90% of a plant, with the rest being other nutrients. They are present in all plant parts and involved in probably all processes that take place in plants. Different plants evolved under different conditions, and therefore have different mineral compositions. Beans are said to be high in nitrogen and spinach high in iron. Perhaps more importantly, some scientists (albeit not very many) think there are plants and other organisms that can take elements and change them into other elements through a process called biological transmutation. If they have an abundance of manganese, for example, they may be able to change it into iron. There has been some research, such as that done by Brazilian soil scientist Ana Primavesi and put to the test by Roland Bunch, showing that it’s important for plants and microbes to have consistent access to a small amount of many different nutrients. In fact, that is much more important than sporadic access to a large amount of nutrients — as is the case when we pile on chemical fertilizers, or even mineral fertilizers, at one time. Ana Primavesi did an interesting experiment. This was done with hydroponics, and it’s just one experiment, but the principles still apply. She had four test plots. Plot 1. A regular solution was given every 4 days. Plot 2. Twice as much was given every 4 days. Plot 3. 1/50th of the regular solution was given every 4 days. Plot 4. 1/50th of the solution was given every 2 days. So the first 3 plots were fertilized every 4 days, while the 4th plot was fertilized every 2 days. Plot 2, with twice the nutrients, did not grow as well, indicating more is not always better. Plot 3 also did not grow as well, so less is not always better. Where it gets very interesting is in plot 4, which grew slightly better than plot 1, presumably because plants had more consistent access to the nutrients, even though it was at 1/50th the amount. So consistent access to a small amount of nutrients was more important than access to a large amount of nutrients all at once. This is also what organic matter does for us in soil. It holds onto nutrients and is composed of nutrients. Through the breakdown process, these nutrients slowly and consistently become available to plants, frequently and a little at a time. 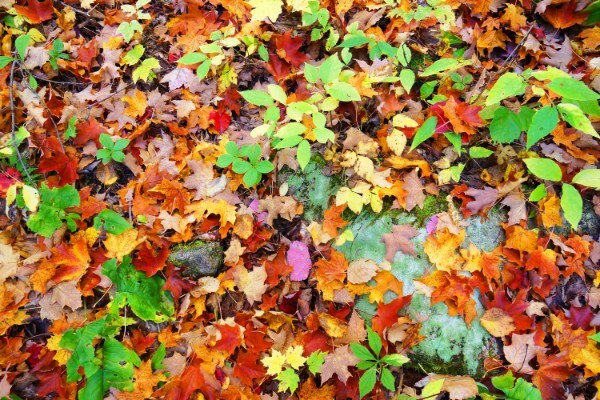 Fallen leaves on the forest floor release their nutrients gradually, as living plants need them. Ana Primavesi, Elaine Ingham and thousands of people around the world have confirmed that plant health is improved when the soil food web is improved, one of the main reasons being that microbes make nutrients more available to plants. One simple experiment from Elaine Ingham illustrates this. Grasses grown in sterile media didn’t do as well as grasses grown with one species of bacteria, which in turn didn’t do as well as the plots where one species of bacterial-feeding nematodes were added with the bacteria. When the nematodes eat the bacteria, nutrients are available that can be used by the plants. Plants have multiple means of protecting themselves, provided they can get what they need from their environment. Most plants need dozens and dozens of elements, not just the nitrogen, phosphorus and potassium found in many fertilizers, and not just the 16 promoted by some sources. It’s more important for plants and microbes to have consistent access to all of these nutrients in the correct proportions, rather than a big influx less frequently.